From the Los Angeles area, take the San Bernardino freeway (Interstate 10) east to Archibald Avenue exit. Turn right; follow ramp directly into Ontario International Airport. Follow signs to terminals and parking lots. For parking, stay in left lanes; lot entrances are on the left. Park opposite the terminal you need. Parking lot are walking distance from the terminals. From Orange County: Take the 57 freeway north to I-10 east. Follow directions above from there. From Long Beach area: Take the 605 freeway north to I-10. Follow directions above from there. From San Bernardino area: Take I-10 west to Archibald Avenue. Exit and follow signs to terminals. From Riverside/Temecula areas: Take the 15 freeway north to I-10 west. Exit Archibald Avenue, follow signs to airport and terminals. 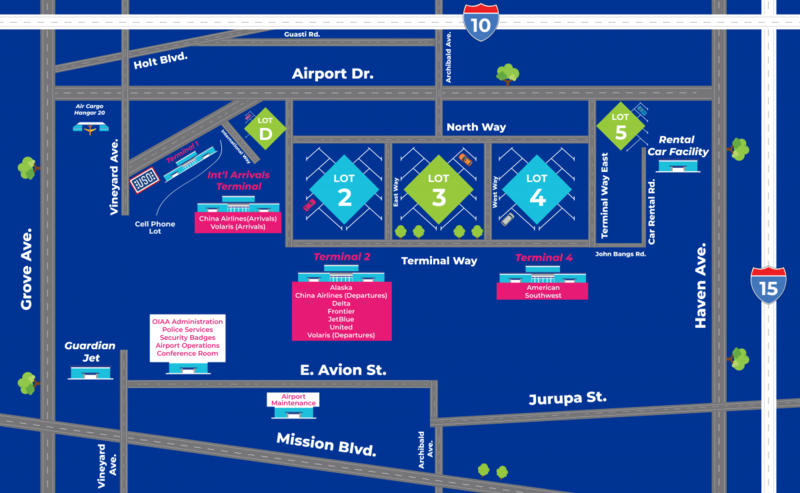 Cell Phone Waiting Lot: If you are picking up a passenger, avoid having to circle the terminal loop road by parking in the cell phone waiting lot free for up to an hour. From I-10, exit Vineyard Avenue, go south to Airport Drive, left to Moore Way. Entrance is off Moore. Once your party is ready for pick up, they can call you and you can proceed to terminal loading and unloading zone. Or you can park in Lot 2 or Lot 4 for $3 the first hour, $2 an hour after that, maximum $18.